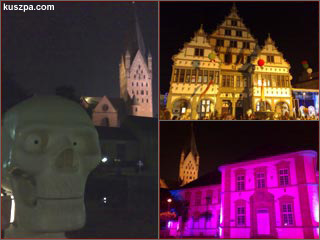 By night: Paderborn cathedral, town hall and convent. In the evening of the NRW Tag in Paderborn the visitors had many great options for a good time; like a 1Live Charts-Party or an open air concert of Sasha :o) And also the whole city was put into fascinating lighting. Our exhibitor went together with some new and old contacts from Saunadorf, the city of Lüdenscheid and the EN-Agentur in Hattingen for a tasty dinner in the Paderborner Brauhaus.